Eagle Nest is a peak that anchors the southern end of the ridge that separates Scott Valley from Long Valley, just outside of the town of Cascade Idaho. There is well used trail that gets to within a half mile of the summit. If you plan to hike the trail, know that it is also popular with mountain bikes and a few motorcycles as well. The summit makes for a great viewpoint, and was reportedly first used as a fire lookout point way back in 1938. That year, a lookout platform was constructed about fifty feet up in the top of a big Douglas Fir tree. Amazingly, the platform was still there when we visited on this hike. We were in Donnelly for our annual “man camp” with a group of good friends I’ve known since high school. I suggested a hike to Eagle Nest, and both Ben and Shane were nice enough to join me. There is a marked trailhead down on Warm Lake Road for the bikers, but we drove road 400 to the upper trailhead to start our hike. The well-used single track trail was easy to follow, and gave us occasional open views as we made our way up through the forest. We had unseasonably good weather for November, and it was great to be out breathing fresh air. The trail was really nice, and we followed it a little over two miles before hanging a left and headed cross-country toward the summit. Apparently there used to be a trail to the top, but we didn’t see much evidence of that. Before the hike, we had no idea about all the history of the mountain, and we were surprised to find a variety of artifacts on the summit. First we noticed an ancient log foundation and an old rusty bedspring. And then one of us happened to look up and saw the old weathered lookout platform high in the top of a big tree. We could also see what remained of the old ladder, and various other historic stuff around the summit. After a quick scamper up to the rocky highpoint, we climbed back down for more exploring of the summit area. The antique structures and artifacts were an unexpected and cool find. We took a different route southeast down to the trail, and then retraced our steps back to the trailhead. Round trip was just under 6 miles and 1200’ elevation gain in three hours round trip. A great adventure with great friends. 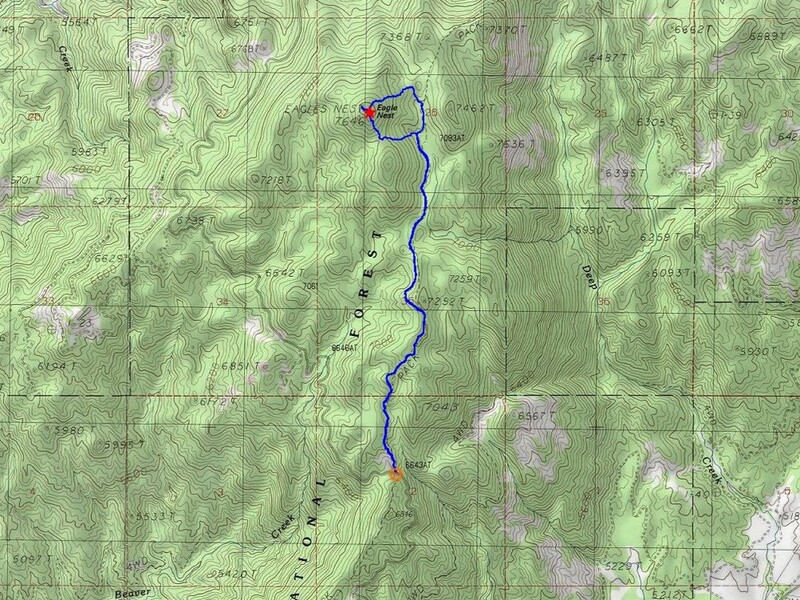 Map of our route, about 6 miles and 1200' elevation gain round trip. A little brush and deadfall, but not bad. Eagle Nest lookout platform from below. Old log foundation and rusty bedframe. Lookout platform from the highpoint. Survey marker on the summit. Zoom in view of the lookout platform built in 1938. Map of our route, about 6 miles and 1200' elevation gain round trip.Hiking past "pancake rock".View up the trail.Pretty section of trail.Bushwhacking toward the summit.A little brush and deadfall, but not bad.View to the north.Eagle Nest lookout platform from below.Old log foundation and rusty bedframe.Eagle Nest summit rocks.Lookout platform from the highpoint.Group shot on the summit.Survey marker on the summit.Zoom in view of the lookout platform built in 1938.Headed back down the trail.